The Octo Finissimo collection symbolizes Bulgari's watchmaking ambition. It offers not only a distinctive and recognizable aesthetic but also a solid and innovative watchmaking content rewarded by several fineness records. Bulgari has thus become a credible competitor of the manufacture of reference in this field, Piaget. This desire to assert itself as a major player in the ultra-thin watches segment is not a fad of engineers. It addresses above all a stylistic approach that aims to make the Octo case evolve in an elegant and refined way. Bulgari was not going to forget its roots and the country of style and design is still Italy! 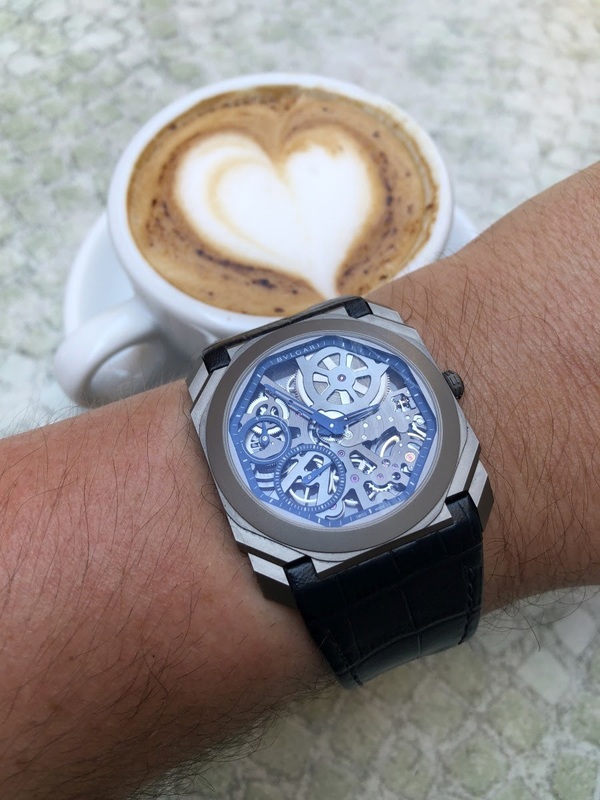 In recent years, Bulgari's watch division has accelerated the vertical integration of the various core departments including the production of dials and cases to gain industrial independence. This independence has raised the technical and aesthetic ambition since Bulgari didn't want to limit the Octo Finissimo to a simple three-hand watch. When I look at the collection in 2018, the point that impresses me the most is the path that leads to a full range of complications some of which are very delicate to develop in an extra-flat context. 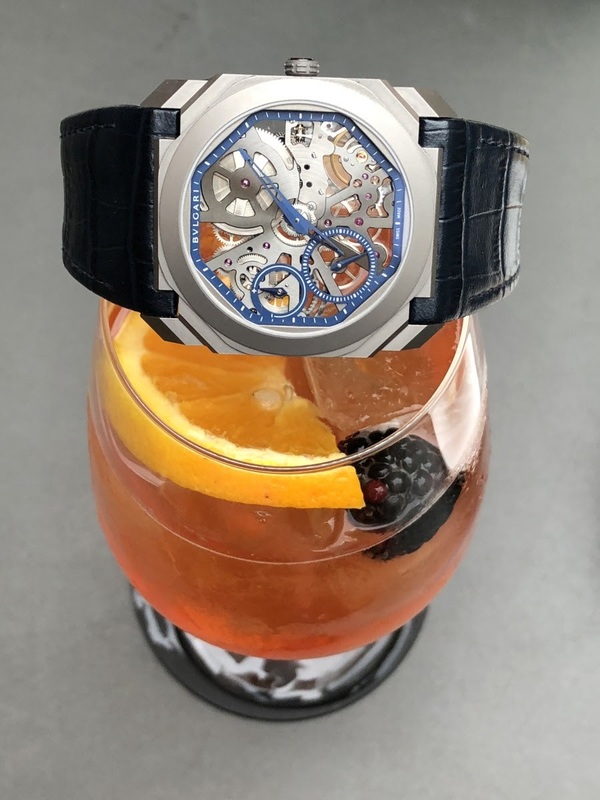 The Octo Finissimo is certainly the three-hand automatic watch with an off-centered small second hand but it is also a handwind tourbillon watch, an automatic tourbillon watch (less than 4mm thick), a minute repeater watch (less than 7mm thick) ... and a handwind skeleton watch. This skeleton watch was for the first time presented in 2016. 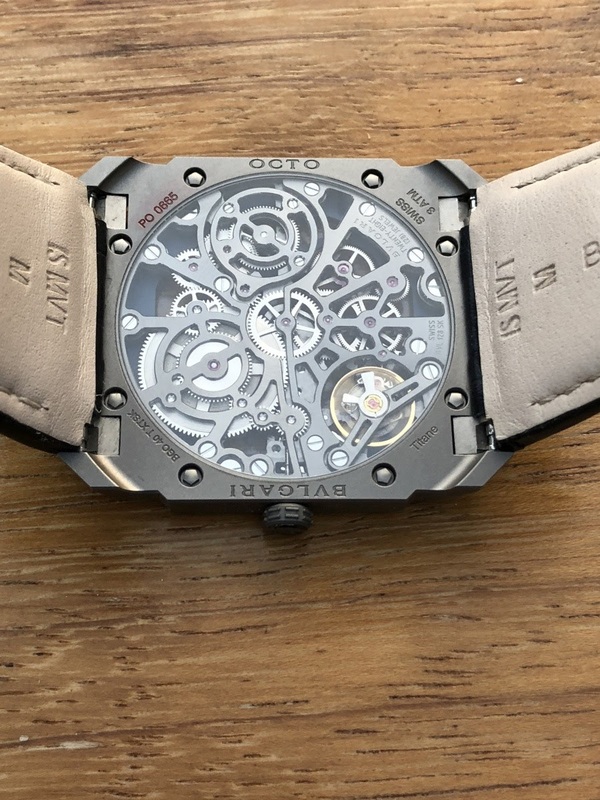 At the time I was seduced by its bold and coherent aesthetic, the architecture of the movement perfectly combining with the geometric rendering of the case. 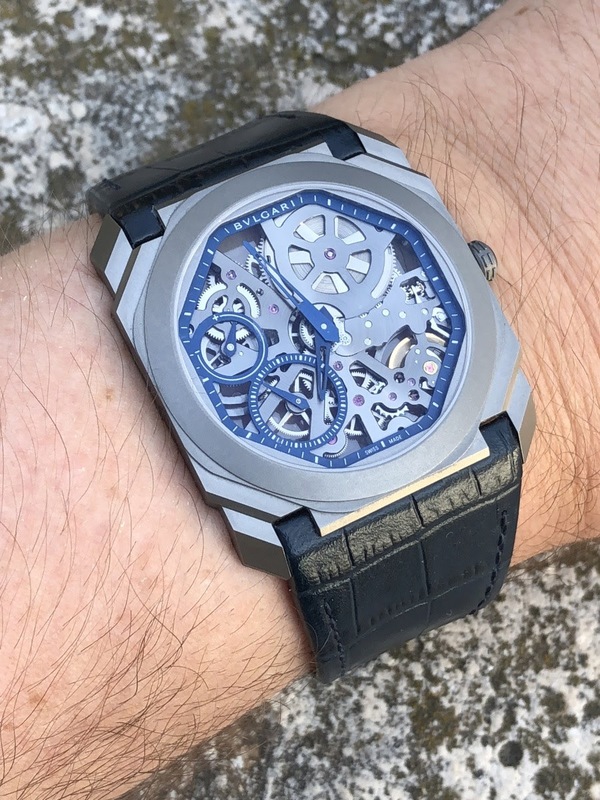 But it was during the last edition of Baselworld which took place a few months ago that I discovered my favorite version in titanium and with a blue dial. I didn't need more to ask Bulgari to lend me the prototype to test it during my traditional holidays in Rome. I would like to warmly thank the Bulgari France team for having favorably responded to my request. I couldn't miss such an opportunity: the watch would go back to its basics, where the story of Bulgari has begun, in this city that inspires the brand every day and whose influence is felt in many details within the collection ... Don't be wrong: if the nerve center of Bulgari's watch division is located in Neuchâtel, Bulgari remains in the first place more than an Italian brand: a Roman brand. 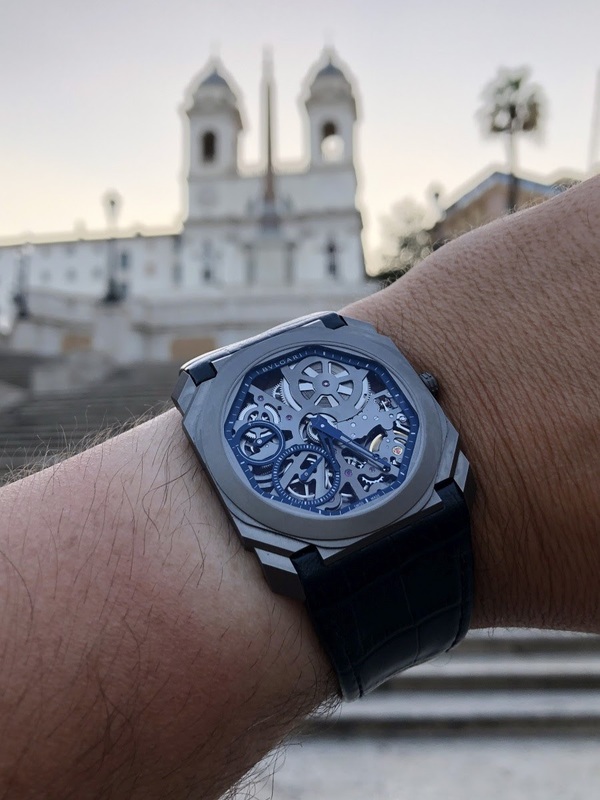 Let's take an obvious example: the shape of the case is inspired by the octagonal ceiling coffers of the Basilica of Maxentius? 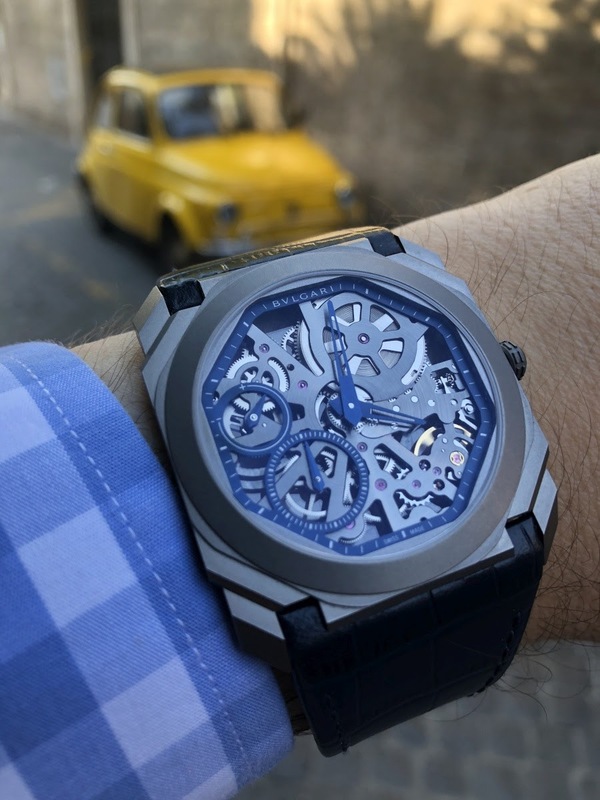 The Octo Finissimo Skeleton Titanium blue dial is an aesthetic evolution of the models that preceded it for 2 years. Its mechanical characteristics are therefore similar because of the use of the BVL 128SK movement and its size remains the same with a diameter of 40mm and a thickness of 5.35mm. Yet this blue-dial version has its own personality. Blue is my favorite color, blue is very trendy in watchmaking but fortunately, this watch is not "crushed" by this color. The color that dominates remains gray. I should rather speak about shades of gray since the rendering of the brushed titanium case, simply sumptuous, is not the same as that of the bridges and the plate of the movement which are blackened (I would rather say darkened) and finished with a circular brushing. The overall chromatic rendering is thus very harmonious, very soft and the touches of blue are integrated with delicacy. The moving elements of the movement like the balance wheel remain perceptible without altering this refined atmosphere. I also touch here a strong point of the watch: given the density of the movement, the effects of transparency are limited and once put on the wrist, the hair is well hidden. The distinguished style is thus preserved! Beyond the blue alligator strap, the blue appears on the peripheral scale, graduations of the second hand and the power reserve and the hands. It remains discreet but very present. 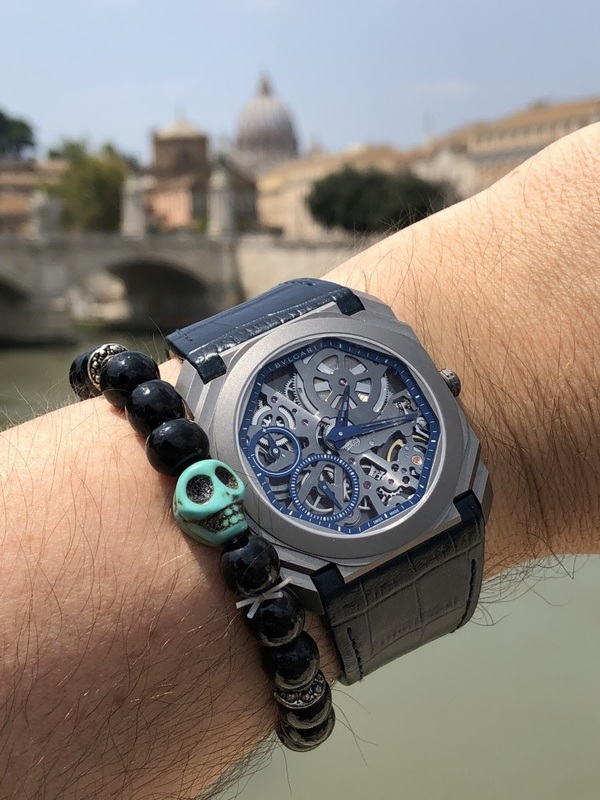 Having the opportunity to wear the Octo Finissimo Skeleton for three weeks, I could appreciate and understand the complexity of its construction. First of all the case presents a surprising design for an ultra-thin watch. I even had a hard time believing that this thickness of 5.35mm was including so many layers and relief effects. And yet, just the observation of the bezel shows the care taken in the case design: the round part is placed on an intermediate base that sketches the octagonal shape of the main part. This is the main asset of the watch: at no time did I feel like wearing a coin or a fried egg. The watch is thin but it is subtle. The diameter of 40mm is in this context ideal because it allows to offer a sufficient size to enjoy the skeleton dial without any risk of disproportion given its small thickness. The short, very curved lugs provide an excellent case mount for the Octo Finissimo Skeleton and reduce the perception of size. The brushed titanium rendering is very pleasant, even to the touch. It helps to give a sober dimension to the watch which did not shine a thousand lights even under the Roman sun. In addition, this sobriety is welcome to highlight the skeleton movement. 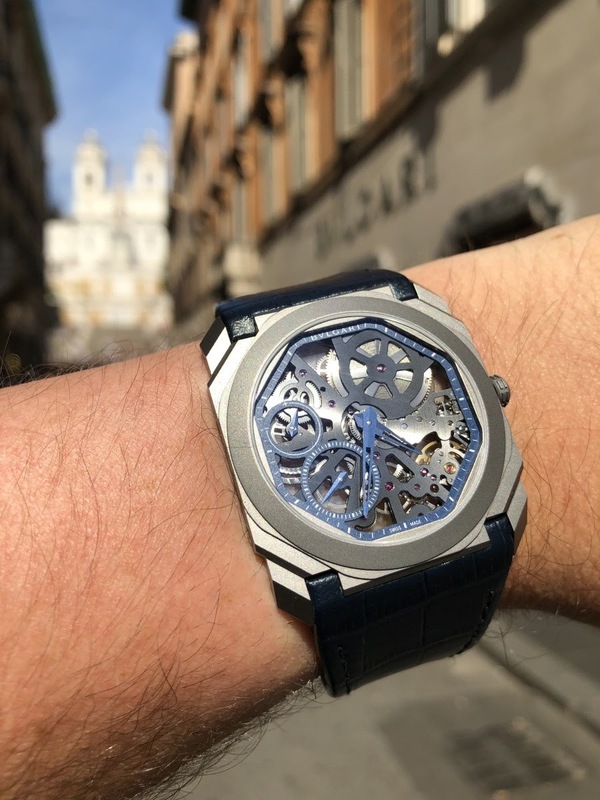 The BVL 128SK caliber is therefore the centerpiece of the Octo Finissimo Skeleton Titanium. This caliber is a technical feat because its small thickness (2.35mm) is obtained in the context of a skeleton lay-out. This assumes that Bulgari worked on the rigidity and strength of the structure. The result is very convincing since I didn't have the feeling to use a fragile movement even while winding it. And the afternoon. The density of population is no longer the same! 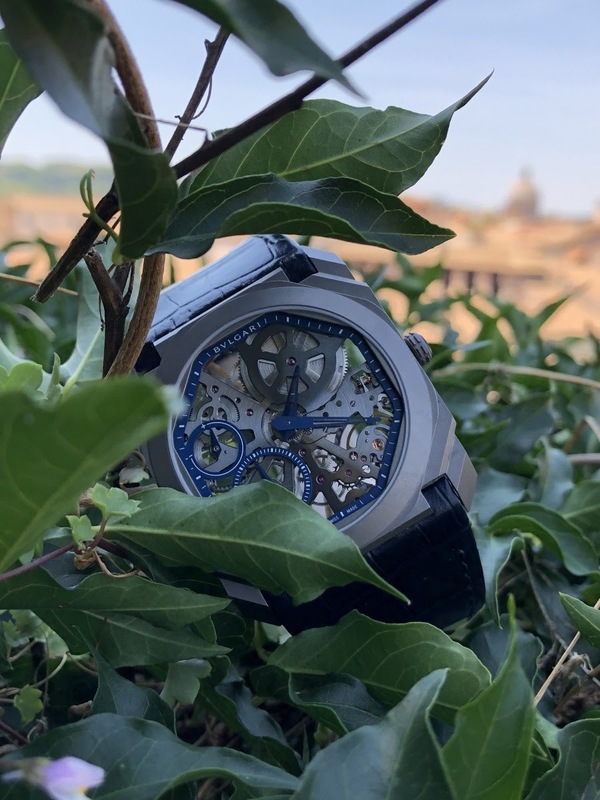 The winding experience is one of the privileged moments with this watch: by turning the crown, the parts related to the winding system come alive and then the Octo Finissimo offers a nice show. The winding feeling is nice but rather firm. It should also be noted that the barrel is relatively large to offer a power reserve of 65 hours for a 4hz frequency. I preferred the daily winding even if the power reserve was sufficient for winding the movement every two days. The power reserve indicator on the left side of the dial is therefore useful given this 65-hour duration. The presentation of the movement is organized as a star-side dial and is beautifully executed. This is obviously an industrial skeleton (the parts are machined as such) but the outcome is neat. The rendering is contemporary and highlighted by the blackened finish of the bridges and plate and the circular brushing. The latter gives nice reflections of lights and it gave me a lot of pleasure. 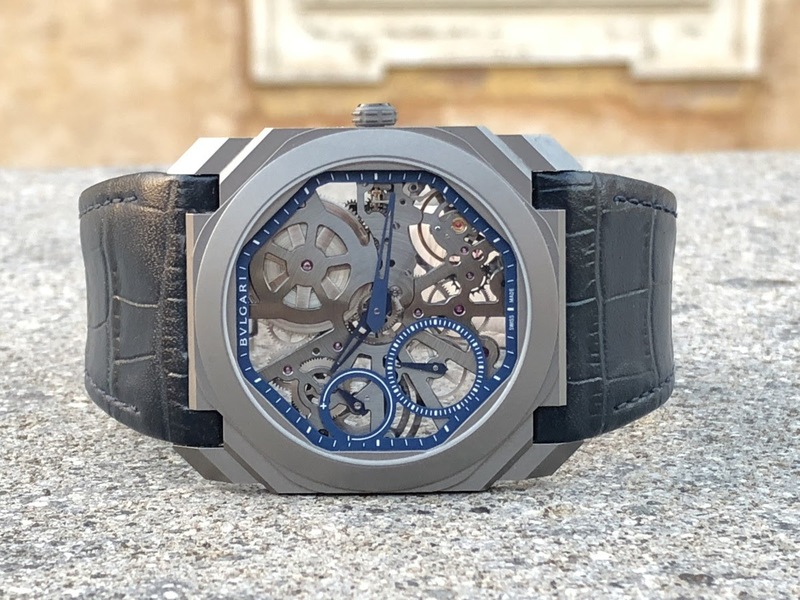 The advantage of the aesthetics of this skeleton is to be consistent with the shape of the case because giving a homogeneous dimension to the piece. In addition, the moving parts remain visible without offering too large openings. The back of the movement is more aerated because of the absence of the peripheral scale present dial side and more pronounced openings. The execution is of the same level of finishes and the whole gives a strong feeling of quality. 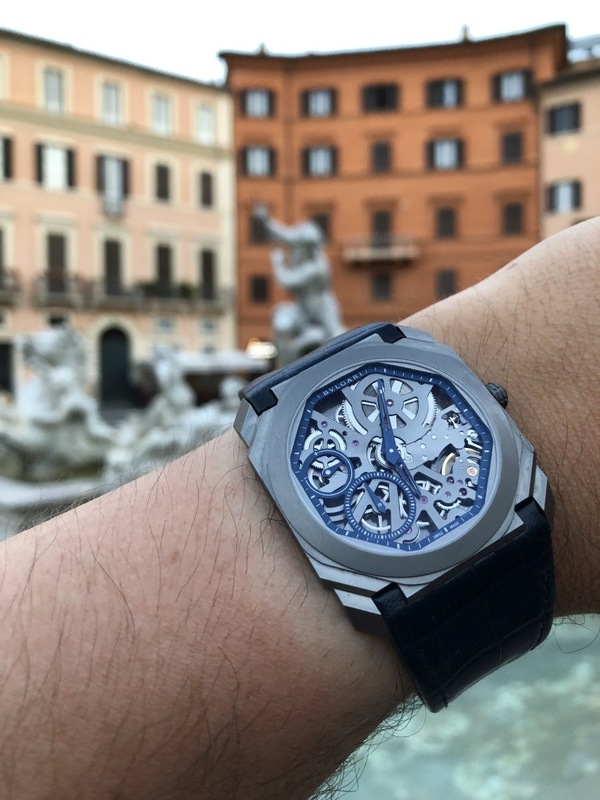 After examining the watch in all its glory, it was time for me to put it on the wrist and enjoy in the alleys of Rome. Nothing replaces the test on the wrist. There is cold analysis on one side and the real feeling of the other. To say that the watch is 5.35mm thick is good. But to express that this finesse is at the service of style and comfort, it's better. The risk with an ultra-thin watch is to be too discreet, almost shy, disappearing under the sleeve of a shirt. 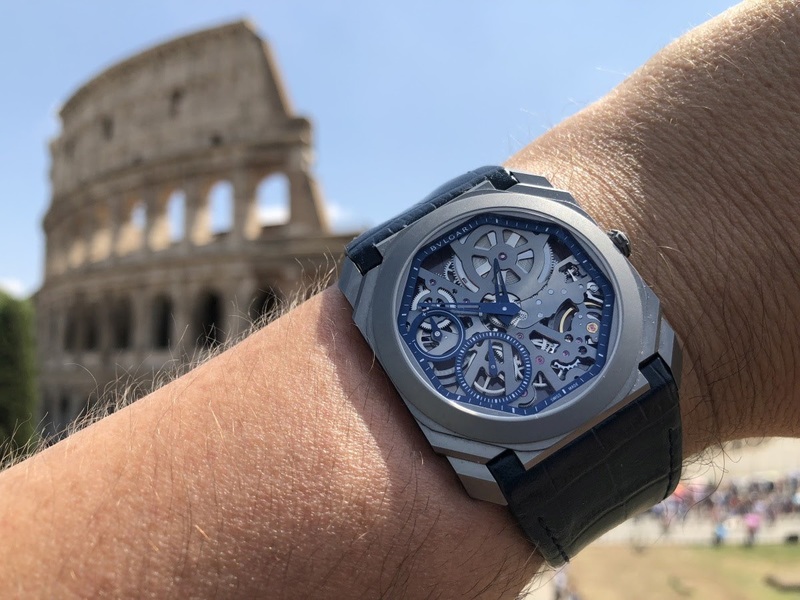 The Bulgari Octo Finissimo Skeleton doesn't have this problem: this watch is beautiful and it features punch and character. I have already mentioned the surprising effects of volume for such a case height. But the design catches the eye and it emerges from the watch a lot of dynamism and audacity without losing elegance or refinement. Back to the roots! The Octo Finissimo in front of Bulgari's historic boutique, Via Condotti. In addition, the watch is lightweight (its weight is around 60 grams) and as the leather strap effectively surrounds the wrist because of the way it is connected to the case, wearing comfort and pleasure are at the rendezvous . But the watch can't be forgotten! I have always continuously, despite its lightness and finesse, felt the case which is also an excellent point (I don't like to have the feeling to have lost the watch...). I constantly put into perspective the successful and efficient design of the Octo Finissimo with the charm and perfection of Roman monuments, some of which, like the Pantheon, are architectural miracles. There is undoubtedly a Roman soul in this watch. Beyond the inspiration of the octagonal ceiling coffers, I find this rigor in the drawing, this blend between circles and straight lines and the consistency between the form and the function. 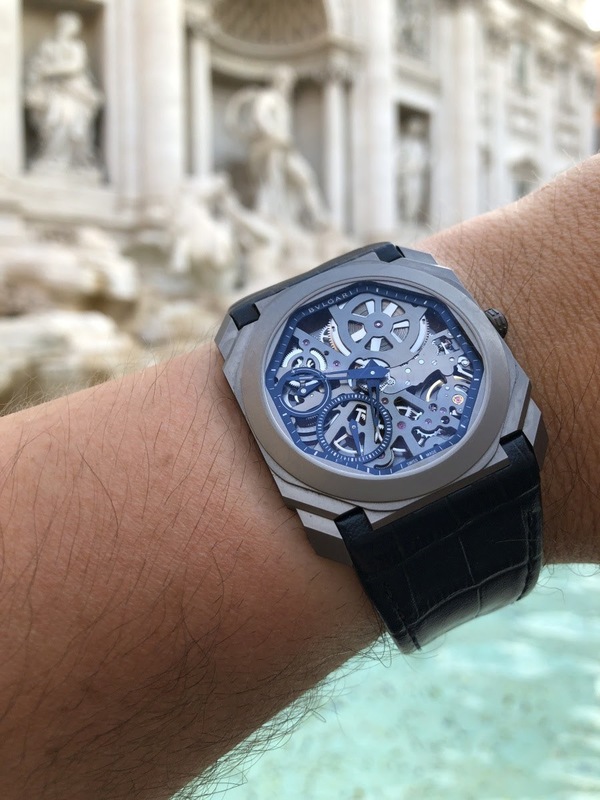 So, would the Octo Finissimo Skeleton be an ideal watch? I am not far from thinking it from an aesthetic point of view. From a practical point of view, however, it suffers from an amplified problem in the blue dial version: the legibility. Taking into account the skeleton movement, the hands have been refined and hollowed out. However, depending on the light conditions and especially in case of drop in intensity or strong lighting, the hands completely fade into the movement. It is finally the paradox: the watch appeared to me more legible in Paris under a cloudier sky than in Rome! As for the hand of the power reserve indicator, I could not read it except to put my glasses when I was winding the watch (this detail is less sensitive). Too bad because the blue version was not far from being flawless. I would like to point out this problem because it didn't seem to be so sensitive to me with other versions like the one with rose gold bezel and hands that I had found sufficiently legible. 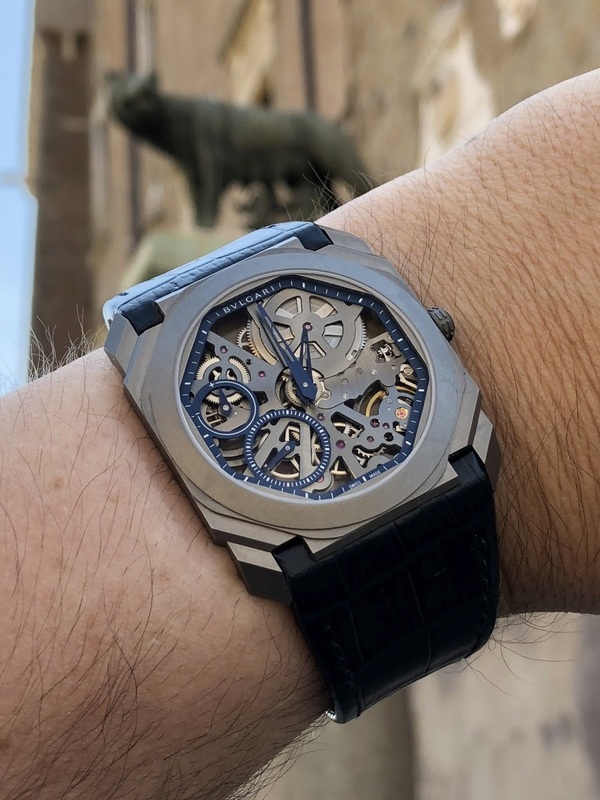 So don't forget to check if the contrast between the hands and the movement suits you when you choose the version of your future Octo Finissimo Skeleton. The other concern I noticed after three weeks of use is the strap. The wear and tear was quite significant around the pin buckle. The shape imposed by the case may have a tendency to wear it prematurely. On the other hand, I really liked the color and the visual rendering that matched the watch perfectly. After the test, I found myself in a special situation. First of all, it confirmed all the good I thought about the aesthetic and creative approach of the Octo Finissimo collection. The case is a true masterpiece, combining style, character and comfort. The skeleton movement is successful and consistent with this very same case. But the test also raised a question mark. From an aesthetic point of view, the blue dial version is my favorite without a doubt. But its perfectible legibility has cooled me down and has directed me more towards the rose gold bezel version, much more convincing on this point. 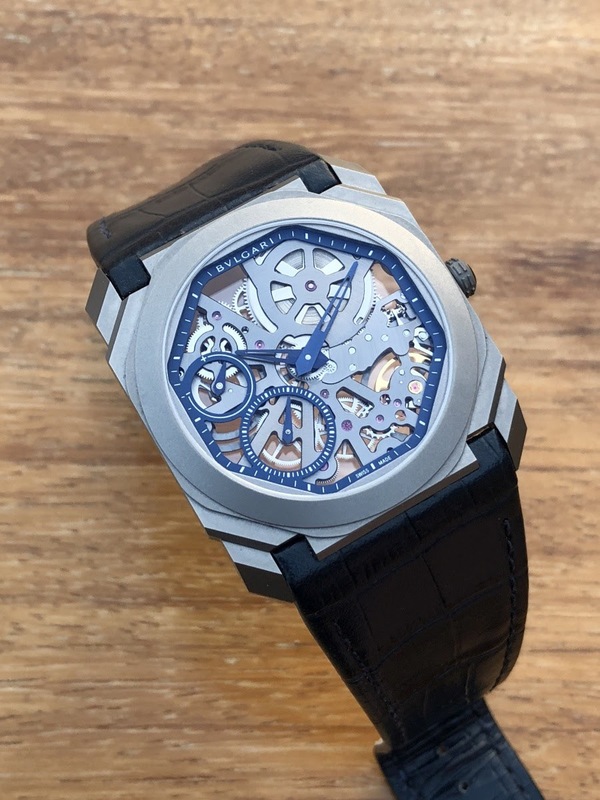 It may be relevant for Bulgari to test another pair of main hands, for example with superluminova instead of hollowed areas to enhance the contrast with the movement. 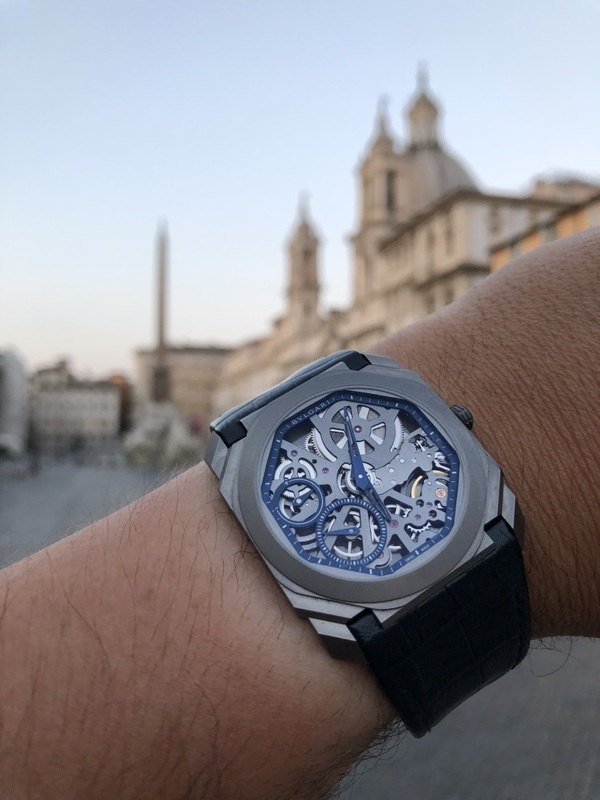 Anyway, it was for me a great pleasure to walk in Rome with a watch emanating from one of the brands that best symbolize the eternal city. 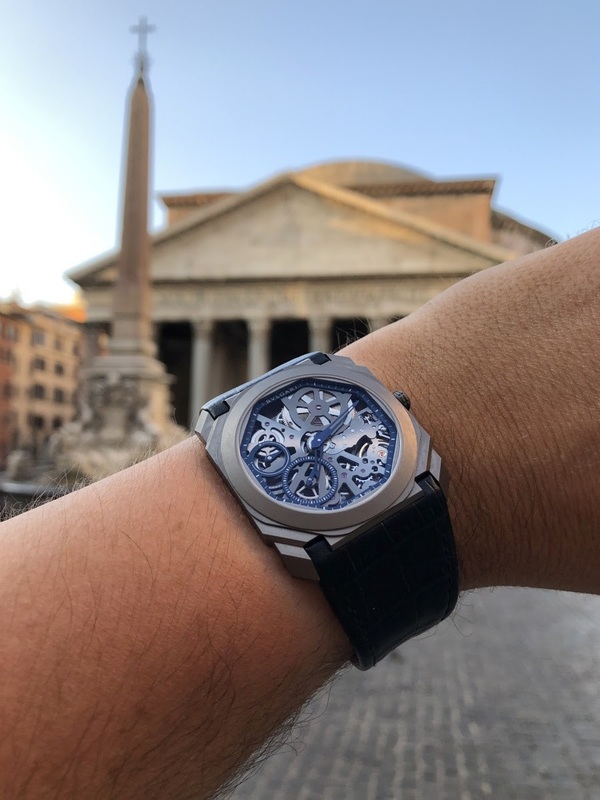 Ancient Rome, Christian Rome, Baroque Rome or contemporary Rome, in each case the Octo Finissimo Skeleton proved to be a distinguished and stylish walk companion. 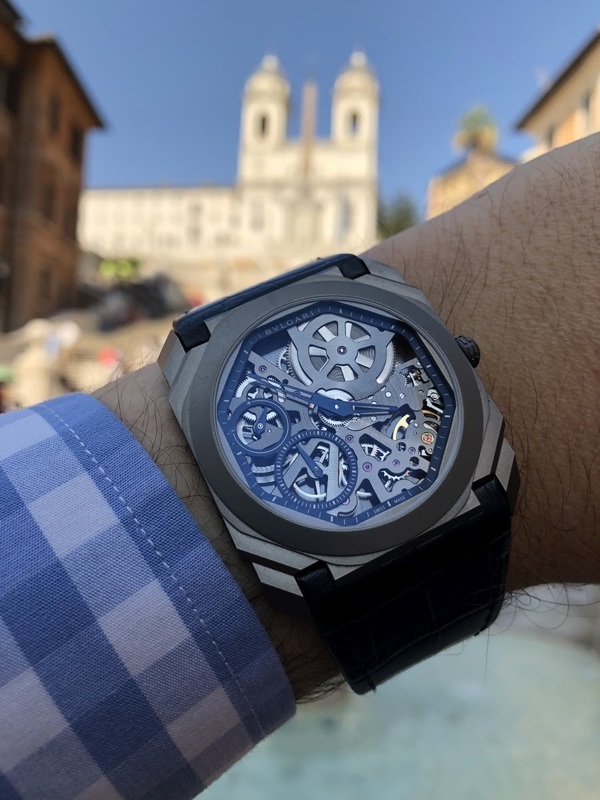 It participated greatly in the success of my stay while reminding me how Bulgari had built in recent years a respected collection in the watchmaking world. When aesthetics and mechanical interest come together, there is no reason not to be seduced. Of course I made my two traditional wishes to the Fontana di Trevi ... maybe I wished an Octo Finissimo to join my collection? Thanks a lot to the Bulgari France team.